I don’t know if there’s something *wrong* with these kids today, but there’s definitely something suspicious about all that energy so early in the morning. Kids like me; my mom calls me the Pied Piper. I remember what it was like being a kid, and usually, I understand what they’re going through, even if I don’t always have the energy or inclination to deal with them. Your food is touching, you’re not ready to leave the park, nobody understands your deep, abiding need to stay up 5 minutes later. I get it. I felt like I was a kid until I turned 35, so I guess there’s nothing to complain about there, but it is weird to wake up and realize, wherever the finish line, I’m probably at least halfway there. In a lot of ways, I still feel like a kid, but at the same time, it’s hard to hang on to that “I’m gonna accomplish everything I ever wanted” feeling after a certain period of life. Not if this is as far as you’ve gotten. Not that I haven’t done a lot of amazing stuff and racked up some serious accomplishment and enjoyed myriad enviable life experiences, because I have. I’ve got some great stories. It’s just that you can’t have everything. Except when you’re a kid and every single avenue is still open. You really could do all those things, if you just make the right choices. Of course when you’re a kid, you don’t necessarily get how important those choices are, that your attitude toward homework, or exercise, or practice can make or break your dreams. But those doors haven’t shut yet. You still could become an astronaut. You still could break a world Olympic record. You still could be a pop star. 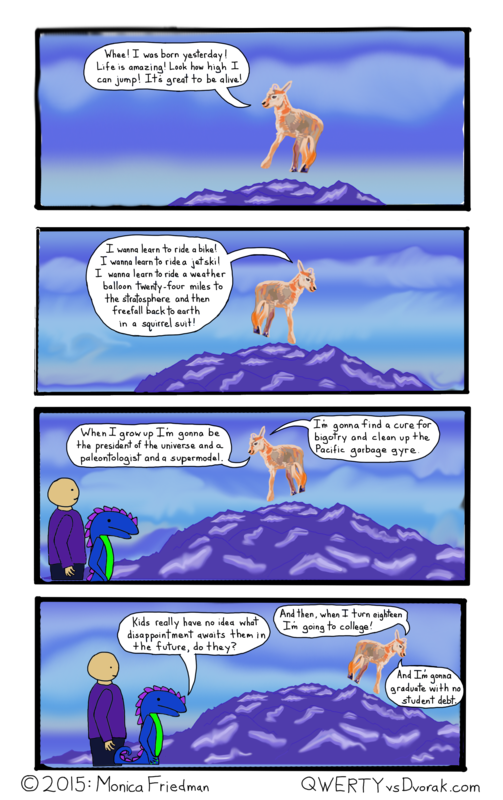 This entry was posted in dragon comics and tagged comics, dragon, dreams, kid, kids, possibilities, The Man on April 24, 2015 by littledragonblue.